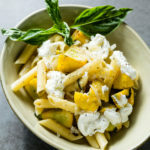 I love summer squash. It comes in all shapes, colors and sizes. If you have a garden, you probably have more than you can use. If you don’t have a garden, the good news is I bet you have a friend or neighbor who is more than willing to share their crop. 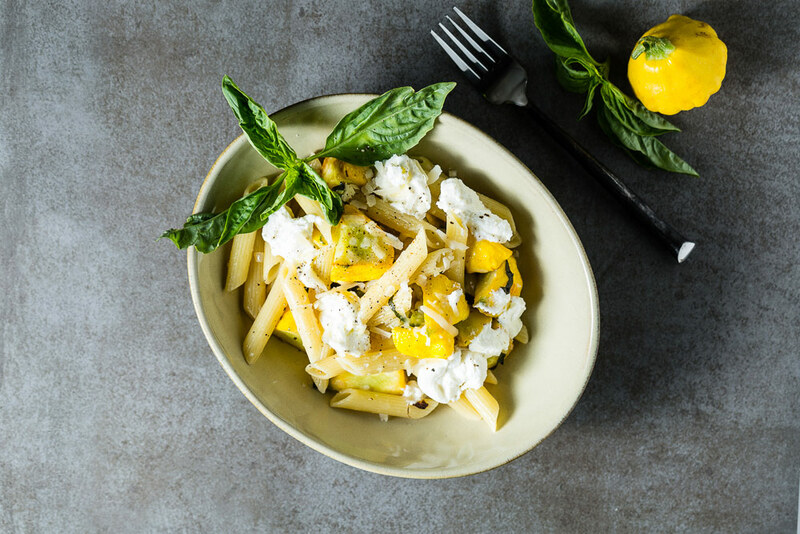 For this pasta, you can really use any kind of summer squash, zucchini or whatever you pick up at the farmer’s market and it will be great. Just be sure to cut the veggies the same size so they cook at the same time. This dish comes together super quickly and is great hot or at room temperature. 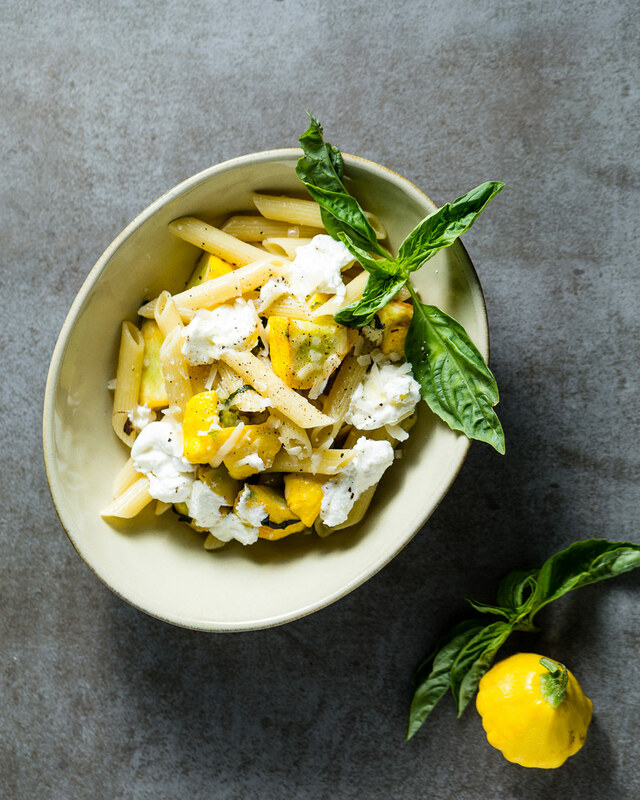 Whole milk ricotta is super creamy and goes perfectly with the basil and summer squash. You also get a nice mix of textures. Of course, you could use reduce fat ricotta, but I highly recommend using whole milk ricotta. Chopped basil is really delicate and turns dark quickly when it is in contact with heat, so be sure to add it right at the end. Cook the pasta al dente in salted water and reserve 1/4 cup of the water. Heat a few tablespoons of olive oil in a large saute pan over medium-high heat. Add summer squash and cook for 4 to 5 minutes, until they start to brown, but still have a crunch. Reduce the heat to medium and add the chopped shallot with a pinch of salt. Cook for 2 minutes, then add the garlic and cook on low for about 1 more minute. Remove from heat and mix in the reserved pasta water and the parmesan cheese. Season with more salt. 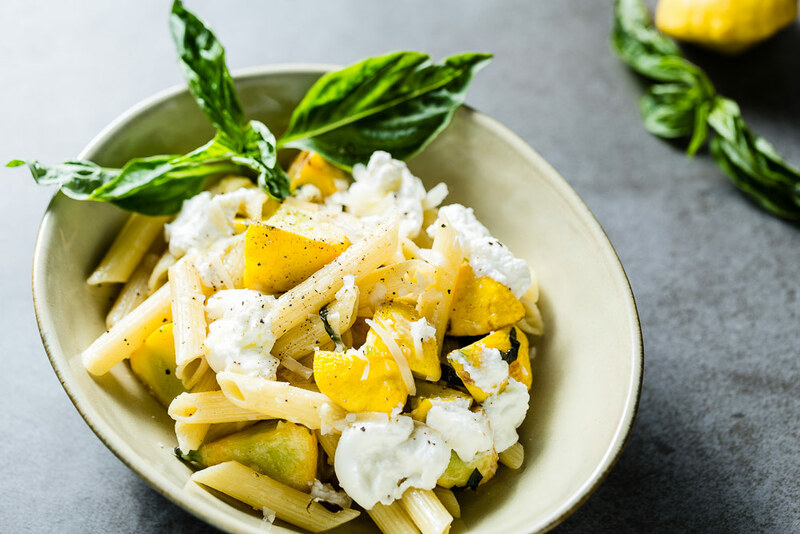 Serve in bowls with dollops of ricotta cheese, more parmesan, the chopped basil, a drizzle of good extra virgin olive oil and a few turns of freshly ground pepper.